In the two-part video below, [The 8-Bit Guy] goes through the gory details of bringing this classic Commodore back from the grave. The first video shows the cosmetic rebuild, which given the filthy state of the machine was no mean feat. Cracked open, the guts were found to be filled with an oily residue; [The 8-Bit Guy] chalks that up to a past life in some kind of industrial setting, but we see it more as flood damage. Whatever the sad circumstances on the machine’s demise, the case required a workout to clean up, and it came out remarkably fresh looking. The guts needed quite a bit of cleaning too, mainly with brake cleaner to cut through the gunk. Part two focuses on getting the machine running again, and here [The 8-Bit Guy] had his work cut out as well. 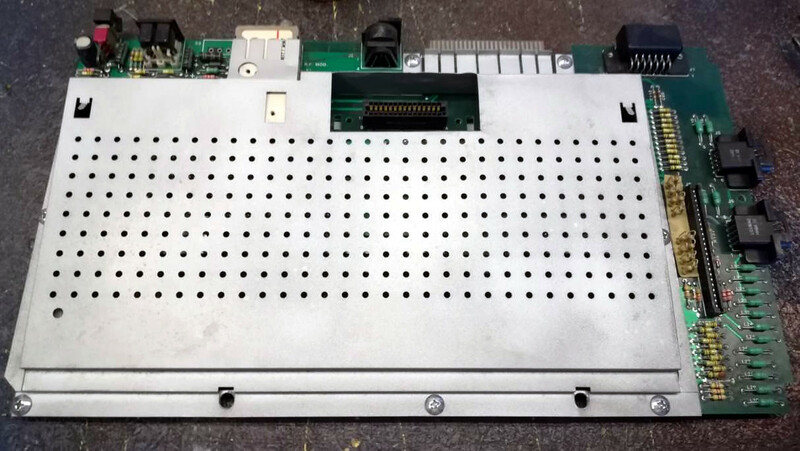 With a logic probe, signal injector, and some good old-fashioned chip swapping, he was able to eliminate most of the potential problems before settling in on some RAM chips as culprits for the video problems he saw at power-up. It all worked out in the end, and the machine looks and acts like new. We’re impressed. Maybe we shouldn’t question [The 8-Bit Guy]’s call on the VIC-20 being from an industrial setting, though. After all, the “little Amiga that could” ran a school’s HVAC system for over 30 years. [Chandler Dickinson] did his monthly sweep of the floor in his blacksmith’s shop when it occurred to him that all that metal dust had to go somewhere, didn’t it? So he did the only reasonable thing and made a crude foundry out of cinder blocks, melted his dirt in it, and examined what came out the other end. His first step was to “pan” for steel. He rinsed all the dirt in a bucket of water and then ran a magnet at the bottom of the bucket. The material that stuck to the magnet, was ripe for reclaimation. Next he spent a few hours charging a cinderblock foundry with coal and his iron dust. The cinderblocks cracked from the heat, but at the end he had a few very ugly brittle rocks that stuck to a magnet. Of course there’s a solution to this non-homogenous steel. As every culture with crappy steel eventually discovered, you can get really good steel if you just fold it over and over again. So he spend some time hammering one of his ugly rocks and folding it a bit. He didn’t get to two hundred folds, but it was enough to show that the resulting slag was indeed usable iron. He did a deeper examination of the steel last week, going as far as to etch it, after discovering that the metal sparked completely differently when sanded on one side versus the other. It definitely needed work, but all seemed to have worked in the end. [Ben Krasnow] hacked together a method of cleaning sides using plasma. His setup uses a mechanical vacuum pump to evacuate a bell jar. This bell jar is wrapped with a copper coil, which is connected to an RF transmitter. By transmitting RF into the coil, plasma is created inside the bell jar. Plasma cleaning is used extensively in the semiconductor industry. Depending on the gas used, it can have different cleaning effects. For example, an oxygen rich environment is very effective at breaking down organic bonds and removing hydrocarbons. It is used after manual cleaning to ensure that all impurities in the solvents used for cleaning are fully removed. According to [Ben], it’s possible to get a surface atomically clean using this process, and even remove the substrate if the energy levels are too high. While we’re all for building circuits on protoboard or constructing a deadbug circuit for a last minute project, it’s always nice to see a proper PCB now and again. We think that leftover flux can sometimes make even the nicest of circuit boards look a bit dingy, and Hackaday reader [RandomTask] wholeheartedly agrees. 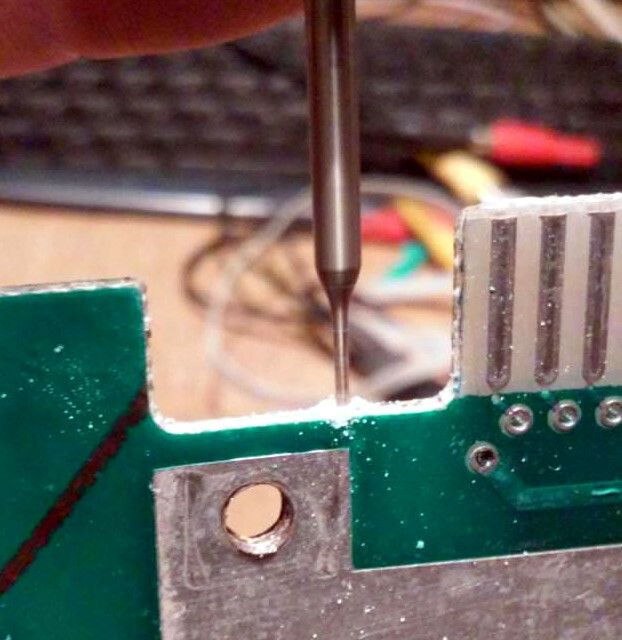 He wrote in to share a method he found online that he uses to get his PCBs squeaky clean after soldering. The secret to his clean PCBs is a product called Poly Clens. It’s essentially a paint brush cleaner that does a great job at removing flux without having to resort to using a brush to scrub it off the board. [RandomTask] simply submerges his newly assembled board in a small container filled with Poly Clens, agitating it for about half a minute or so. After the flux has been removed he rinses it with water, pats it dry, then ensures the board is moisture-free with a few passes of his heat gun. He says that the entire process takes him less than 5 minutes per board, which is far better than the old alcohol and stiff brush method he used in the past. What tips or tricks do you have for getting your new projects cleaned up? Be sure to share them with us in the comments. [BiOzZ] wanted to try a different keyboard layout than the ubiquitous Qwerty, so he grabbed an old keyboard and converted it to the Dvorak setup. This was accomplished by first popping off all of the keys from the black keyboard seen above, and boy did he find a mess underneath. It was nothing that a trip through the dishwasher (for the case only) wouldn’t fix, and the next step was to replace the keys in a different order. He found that a couple of them wouldn’t just go back in a different place, but had to be rotated 90 degrees to fit. Not a huge problem, you can see that he overcame the visual speedbump of letters facing the wrong way by adding his own letter labels. From there he walks us through the process of getting Windows to switch to the Dvorak layout. I went through a similar process at the end of last year. I was experiencing a lot of pain in my hands from my prolific feature writing here at Hackaday so I chose to try out the Colemak keyboard. 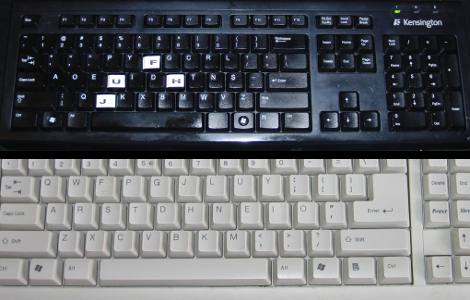 The white keyboard above is the one I repurposed using that layout. I found it quite easy to switch between two keyboard layouts using Ubuntu. After you’ve set it up in the keyboards dialog a layout icon appears on the panel. It wasn’t hard to pick the new key locations up, but it did reduce my typing speed by a factor of 8. In the end I found that adjusting my chair height and keeping my hands warm did the trick and I’m back on the Qwerty where I belong.